Here’s an interesting mashup. Our friend Mr Cool has used the interchangeable cam from the T.Rex mixed it with Guard dog dog to create this delightful model. Nice one! Meanwhile Michael42er has produced this elegant modification to the recent Owl model. 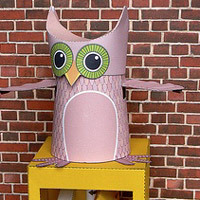 A simple cam on the vertical shaft flaps the owl turns his head. Fantastic work Michael!